This Month's DB challenge was the Battenburg cake!! Since the time it was announced, almost-teen has been obsessed with it and claims that this is the best thing that has happened to her this summer. For those of you who are not aware of it, she is quite - very - obsessed with Britain - and that's an understatement. As for where it comes from, well.... she happens to be an ardent Harry Potter fan! She's reread Harry Potter some obnoxious amount of times until I threatened that if I saw her with Harry, he will be thrown out. Now Harry has been taken over by the history of UK ....and no one is complaining anymore. And with this new Britain-related obsession, she's spent countless hours perfecting her British accent, which has come a long way.... So now you get the picture.... the timing could not have been more perfect. A tea party - along with the royal cake was some English tea and a good book about the Queen. *The cake has royal beginnings - the chefs of the British Royal Family were introduced to the German style of cake making during Queen Victoria's reign. This included the use of bright colors and marzipan. The first Battenberg cake was made in that German style to celebrate the wedding of Queen Victoria's granddaughter, Princess Victoria of Hesse and by Rhine, and was named after her husband, Prince Louis of Battenberg. 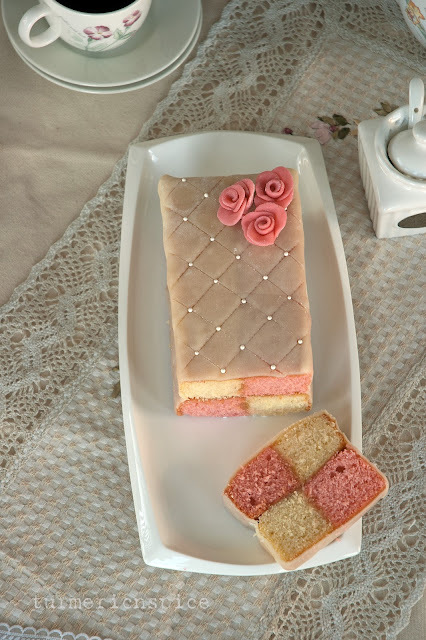 It’s traditionally flavoured with almond and has the signature Battenberg markings, the yellow and pink squares (said to represent the four princes of Battenberg). 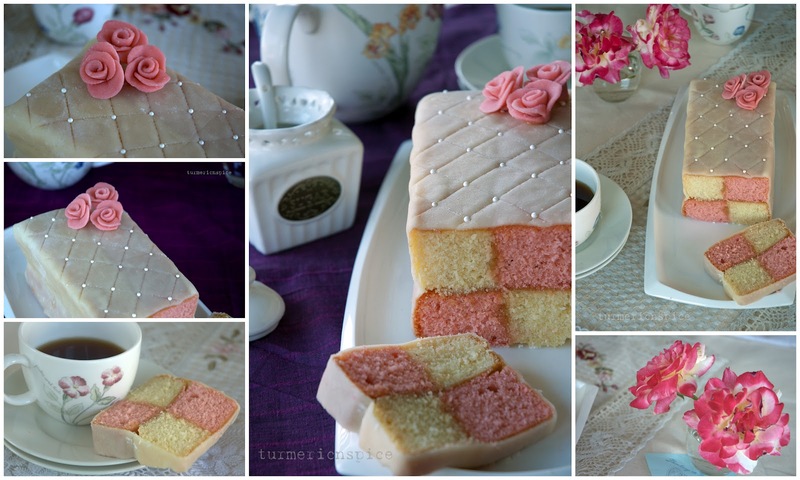 The strips of sponge are glued together using jam (normally apricot) and the whole cake is covered in marzipan. Sometimes the edges are crimped and the top is patterned with a knife. Thanks to Mandy of What The Fruitcake?! came to our rescue last minute to present us with the Battenberg Cake challenge! She highlighted Mary Berry’s techniques and recipes to allow us to create this unique little cake with ease. There were just too many choices - you could pair any two flavors and marry them into this exotic royal treat. After a lot of thinking and no pressure (*cough cough*) from a certain someone, I was told - sorry, I made the original pink and yellow with marzipan. I substituted lemon curd for apricot jam and lemon flavor for almond flavor. It was fit for royalty, to say the least!! Whisk together the dry ingredients then combine with the wet ingredients in a large bowl and beat together just until the ingredients are combined and the batter is smooth. Divide the batter into two equal parts. Add the lemon zest to one half and spoon it into one side of the baking dish. Bake for 25-30mins until the cake is well risen, springs back when lightly touched and a toothpick comes out clean. 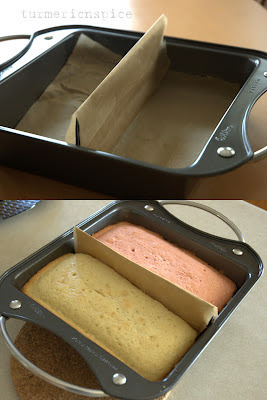 Cut each coloured sponge in half lengthways so that you are left with four long strips of sponge. Neaten the strips and trim as necessary so that your checkered pattern is as neat and even as possible. Warm the lemon curd and use it as a glue to make a checkered pattern. Dust a large clean surface with icing sugar and roll the marzipan in an oblong shape wide enough to cover the cake. It was not easy to work with marzipan under the humid condition. Brush one side and top of the checkered cake structure with the lemon curd. Now move the cake to the side it has been glued and do the same for the other 2 sides. Trim off the ends of the cake (the small, square ends) with the excess marzipan to reveal the pattern. With a serrated knife make the pattern on the cake. Decorate as desired, I used edible pearls and made some roses from marzipan. The pics, the cake, the rose, the decoration .. all perfect! Wow. 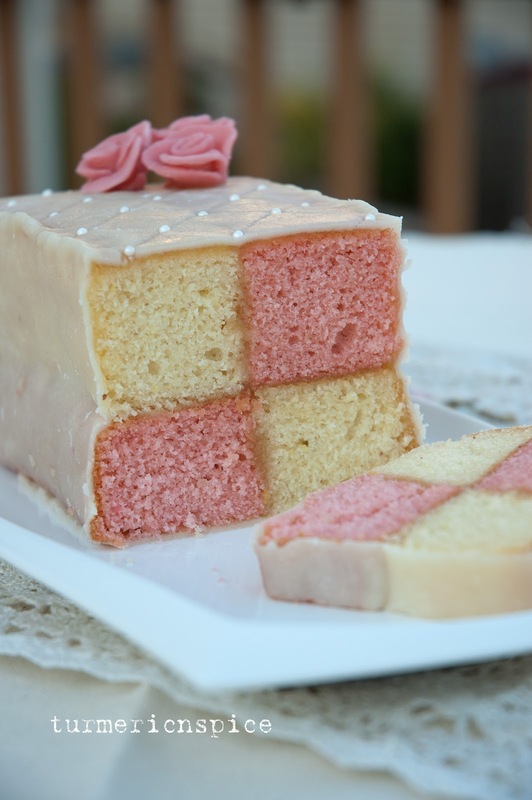 Looks so soft spongy and delicious ! Simi, this is what I was hoping my cake would look like - it's so beautiful! And it sounds delicious as well. lovely. definitely its THE cake fit for royalty. Your cake is just beautiful - I really love the pink roses you made for decoration. What a lovely, refreshing cake. Thanks for sharing! Hey Simi,thats a beautiful cake..how did u feel like cutting it?? and its comes out so perfect the pattern,yummy yum ..Awesome bake & great efforts! 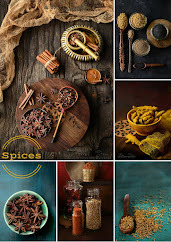 Looks very delicious and elegant. Wow Sii what a lovely cake. Truly elegant and beautiful color. 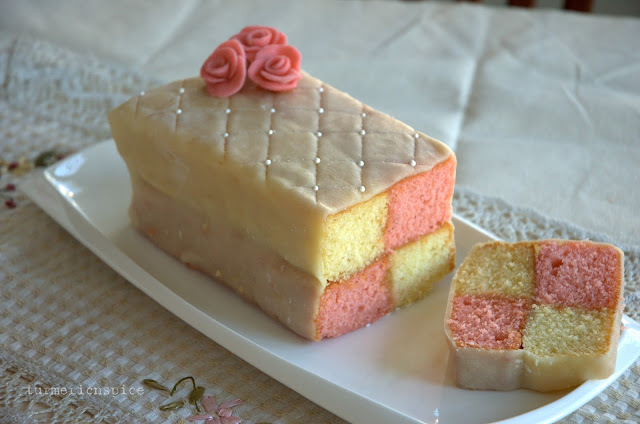 Beautiful battenberg and your clicks are great too. Love the roses on the top. Great presentation! Looks absolutely divine and mindblowing. The photos are absolutely dreamy--a perfect tea party with fancy cake. It sounds like it was the perfect challenge for you and your daughter! Your cake looks great! Looks like it you got a perfect rise out of the batter in the oven! Love the colors - truly stunning! wow.. Great job Simi. Its perfect and awesome. Really loved it. wow! 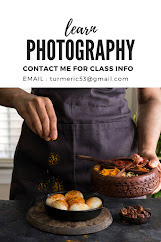 absolutely loved the cake...Baked to perfection and great clicks. 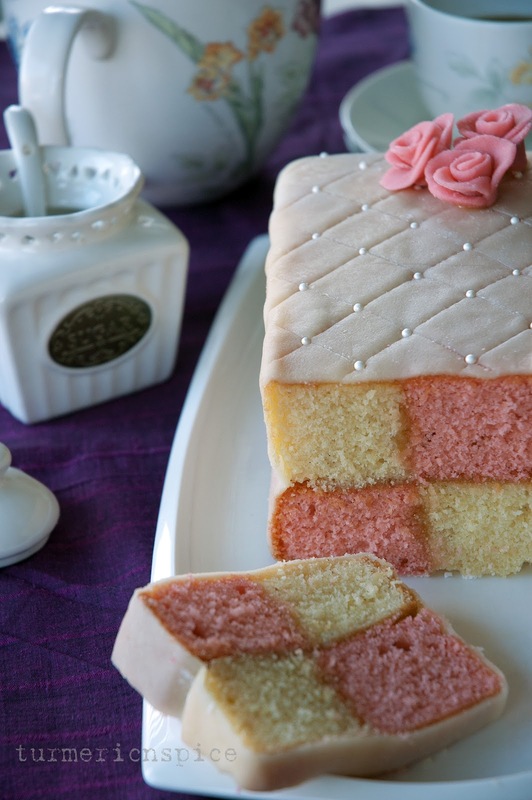 Your Battenberg is classic and beautiful! I love the roses on top - tres jolie! That looks absolutely stunning! Our roses are demolished too - told my hubby this is the last year of roses - as many beautiful flowers our there as roses - they do invite Japanese beetles by the hundreds! Oh my what a lovely cake. Loved that colour and texture. Gosh such a gorgeous cake and the colours are adorable! I wouldn't dare to eat the cake for any reasons.. This cake looks divine. 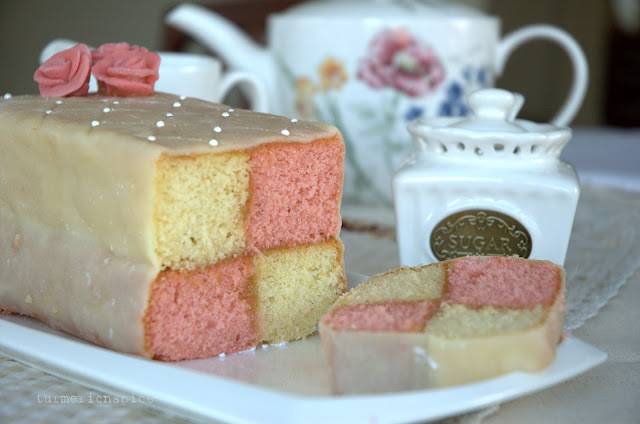 I first had a Batteburg Cake in London for Afternoon Tea. It was heavenly. 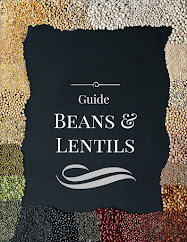 Bookmarking.